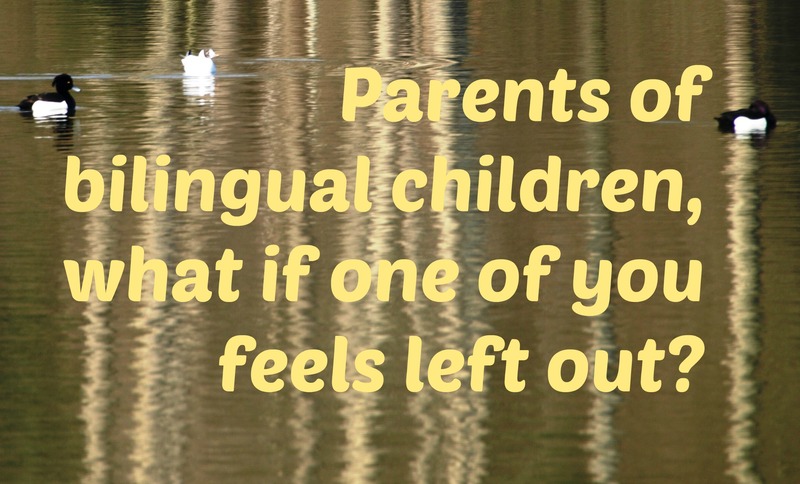 Parents of bilingual children – what if one of you feels left out? “What if I don’t understand what my child is saying?” is one of the bigger concerns a parent of a budding bilingual child can have. It can be a worry especially for parents in families who follow the one parent, one language (OPOL) strategy. Parents who do not understand the other parent’s language can have a real fear of being left out of family conversations and not being able to fully follow their child’s language development. Depending on the family’s language setup this can happen equally to minority and majority language parents – it just depends on which language the child learns first. If it is the minority language parent who feels left out, which means that the majority language is the dominant language for the child, there is potentially an even greater worry of the child not learning the minority language at all. In most cases a minority language parent however also knows the majority language so feeling left out is not as common. In trilingual families where both parents speak a language different to the language of the community, potentially both parents can be concerned about understanding their child. It will take co-operation and flexibility from both parents to make the situation work for everyone. This concern is probably the most common in families where the child initially gets more exposure to the minority language and this becomes the first dominant language for the child. The majority language parent who naturally also wants to share the experience of the child learning to speak may feel side-lined. At this point is of not great comfort to the parent that the child’s dominant language will most likely change to the majority one after some years. Small children can learn two languages simultaneously, so the majority language parent should be encouraged to interact as much as possible with the child. What to do to prevent a parent from feeling left out? My recommendation – as always – is to openly discuss the situation. The parent who is worried may not want to bring up the topic for the fear of sounding selfish or uncooperative, so it is perhaps good if the parent who speaks the child’s dominant language asks the other parent if there are any concerns. Reflect on how the decision to bring up the child to become bilingual was made. Perhaps it was not a conscious decision at all, just something which was regarded as a common understanding. But was it genuinely “common” in the sense that both parents had their say and were given the opportunity to raise their concerns? Or was it just taken for granted (usually by the minority language parent) and not discussed at all? If it was a mutual decision, what was the plan – who would speak what language when and has this plan been followed? Discuss the situations where one parent feels left out – which situations are especially difficult and are there occasions where it does not matter as much? If ALL situations where “the other language” is spoken make a parent feel uncomfortable, then you may have to have an even more profound discussion about how you can make bilingualism possible for your children. What to do to solve this conundrum? There are really only two options: using a common language or translating – well, there is a third: that everyone learns each other’s languages, but that is not really realistic, at least not in the short term. Everyone speaking a common language in the presence of the parent who feels left out is a viable option if there will still be enough exposure to the minority language for the children. The minority language parent will however have to be very consistent to stick to his or her language when communicating with the child in other situations. If changing to speaking to a common language means that the child will miss out on becoming an active speaker of the minority language, the parents should, again, discuss the situation between them and agree how to continue with the languages. Translating is probably the solution most families go for. Initially translating more or less everything usually does alleviate the worst worries. Sometime parents forget that a child does not learn to speak overnight and both parents will have the opportunity to pick up words alongside the child, providing the willingness to do so is present. Families generally find that the need for translations lessens by time. So much however comes down to attitude – a positive feeling towards all family languages makes everything easier. This is the reason why it is paramount to discuss the situation and come to an understanding. Whatever you decide to do, the relationship between a parent and a child is more important than what language is spoken. Language is there to make communication easier, not to cause rifts in family life. If you do have to give up on a language, don’t feel that you have failed. You did your best in the given circumstances. Also keep in mind that a language which has become “passive” for a child – meaning that the child can understand the language but is reluctant to speak it, also called receptive bilingualism – can be “brought back to life” later on. And, like I have said on many occasions, some language knowledge is better than none at all. This is a very important topic among multilingual families! I’ve seen this so often that couples would prefer the majority language, making one partner feel left out. I completely argee with you that “a positive feeling towards all family languages makes everything easier” and this is something couples/partners should consider even before having children. By valorizing and even learning the other language, the language choice with the children and also the extended family (!) can become much easier or at least less stressful. In my opinion it is a great sign of respect towards the other person and his or her culture to at least try to learn his/her language. And I think this is even more important when the other language is a minority language or a dialect. – I had this discussion with my husband: his mothertongue is Swissgerman, mine are German and Italian. We choose to talk them all during the first years with our son and that was the best solution for all of us. Couldn’t have said it better myself, Ute! Great post, Rita! This is the topic I am working on for my blog as well 🙂 I really think multilingual family members need to concentrate on learning each other languages. We are a trilingual family and everyone speaks each other language. It helps to have a smooth conversation. Parents reply to children in their own language, and there is less need for translation. Yes, ideally everyone learns each others’ languages, but I don’t think that is a realistic goal in every family. Many parents simply don’t have the time or the inclination to learn another language. Thank you so much for your kind comments! How great that you did manage to pick up Irish as well – which language do you speak to your children? Best of luck with everything!